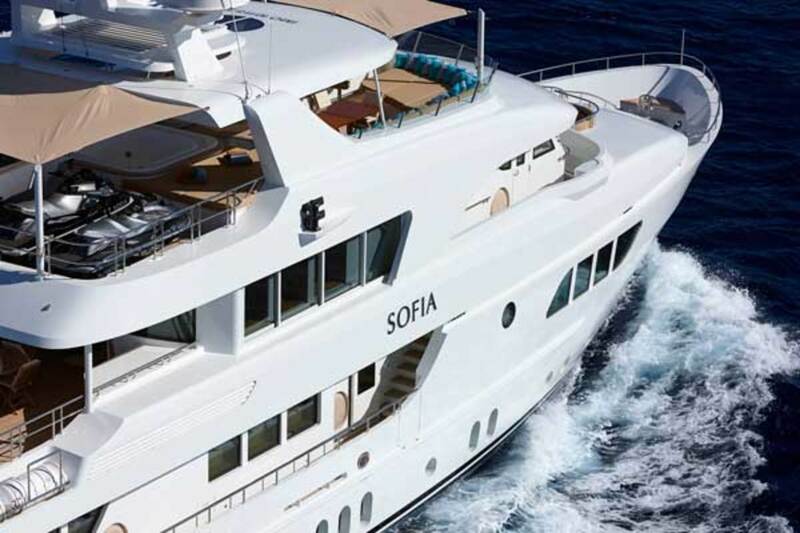 Sofia stood apart from the crowd at the Cannes, Monaco and Fort Lauderdale boat shows. It was impossible to pass by her without noticing the flamboyantly yellow submarine perched on her aft deck. 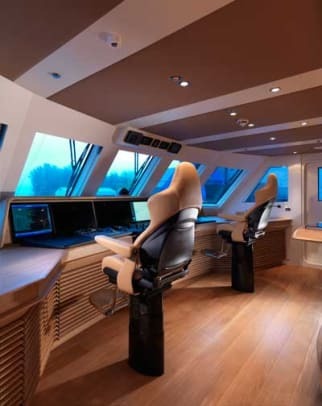 The sub certainly caught my attention, and when interior designer Frank Pieterse treated me to a tour of the yacht, I discovered the sub was merely a tease to the surprises within. 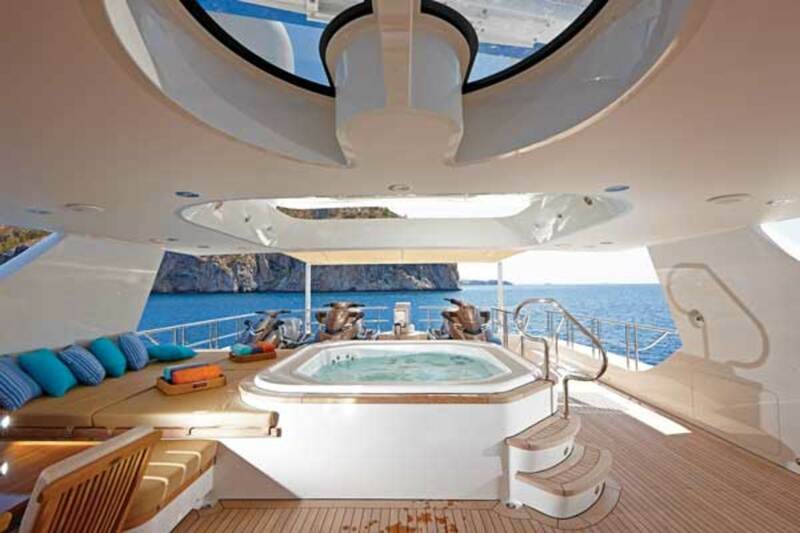 There&apos;s more than meets the eye on board Moonen&apos;s 138-foot Sofia. Her sumptuous interior moves the heart and stirs the soul. 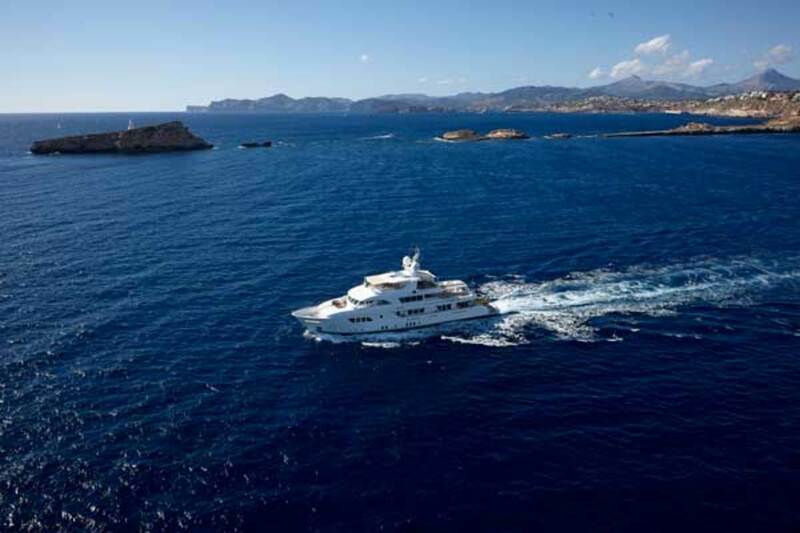 Love your yacht? Why not become a shareholder in the company that built it? 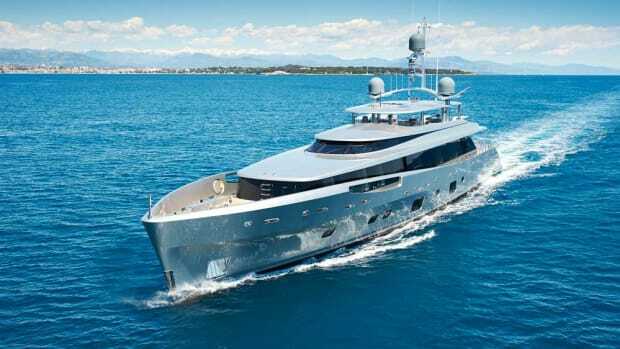 That is exactly what the owner of the new 138-foot (42-meter) custom-built Moonen Sofia did. To say he is enthusiastic about Moonen is an understatement. 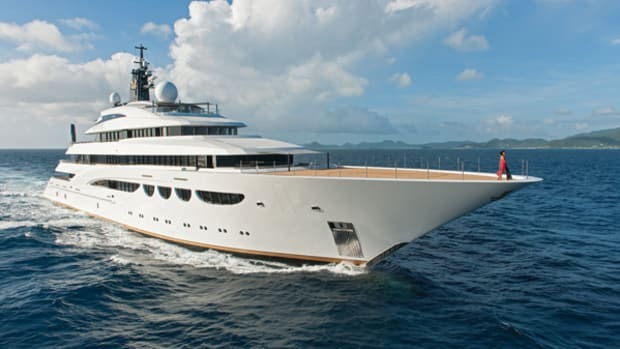 Sofia is his third consecutive yacht from the yard, and because of his directives, the yacht is the largest and most technologically advanced that Moonen has delivered. 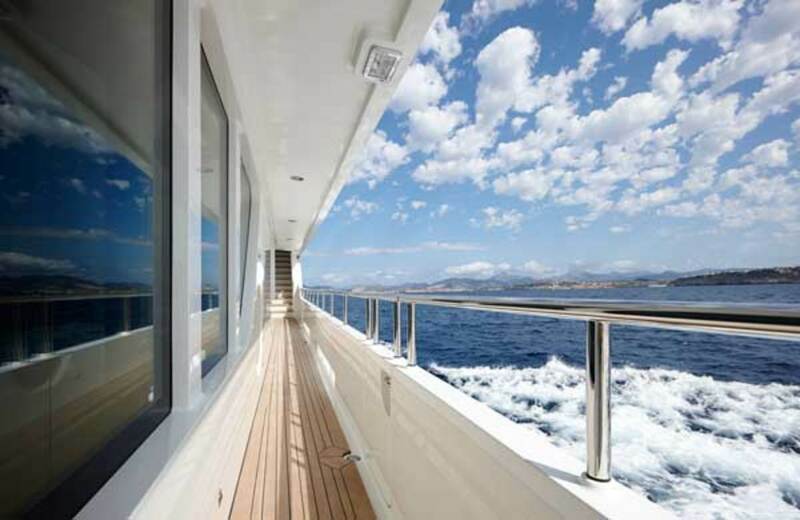 Sofia stood apart from the crowd at the Cannes, Monaco and Fort Lauderdale boat shows. 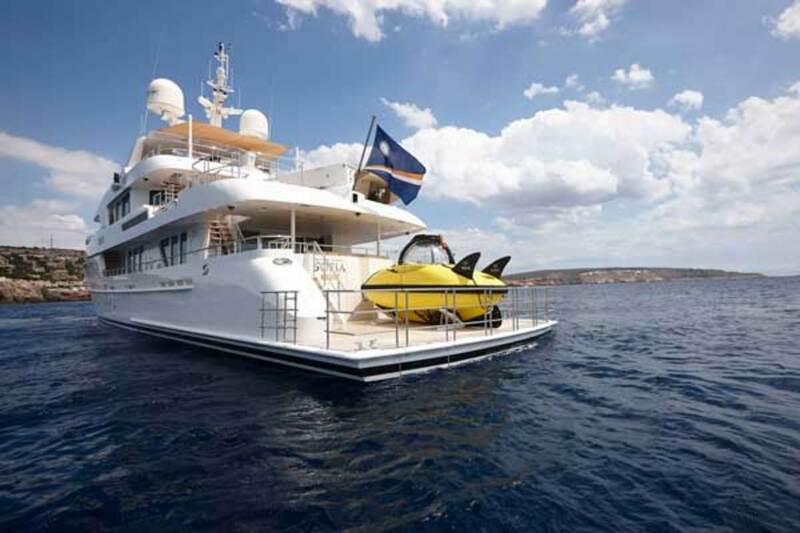 It was impossible to pass by her without noticing the flamboyantly yellow submarine perched on her aft deck. 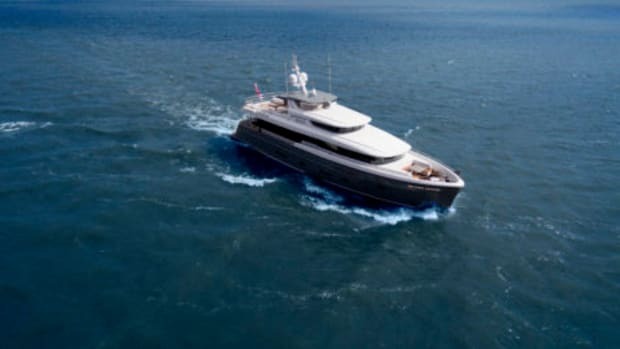 The sub certainly caught my attention, and when interior designer Frank Pieterse treated me to a tour of the yacht, I discovered the sub was merely a tease to the surprises within. The open-plan main salon features curvilinear sculptural structures and furniture that is oval-shaped or rounded. Sofia is built to Lloyd’s and MCA specifications with naval architecture by Stolk Marimecs. Moonen masterminded her engineering in-house, and René van der Velden styled her no-nonsense exterior. The captivating interior styling is the handiwork of Art-Line, the Netherlands-based design firm headed by Pieterse and Marilyn de Vaal, who were responsible for the interior design of the two previous Sofias. Art-Line worked closely with the owner and the Moonen team to get every detail just right. 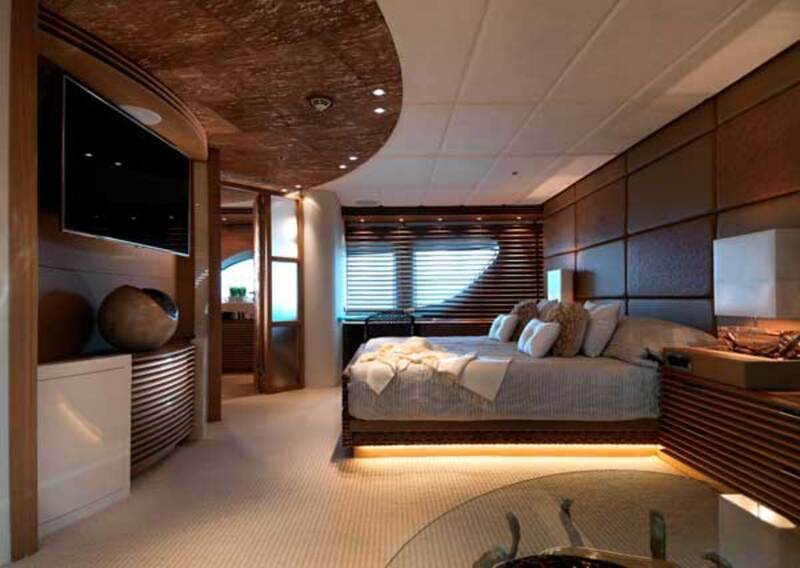 In the full-beam master stateroom, the bed is placed off-center to make room for a lounge area. Sofia’s owner is a gregarious and affable gentleman of Mexican heritage with dual Mexican and American citizenship. He has global business interests and claims to live in a jet—when he’s not on his yacht, that is. Flying and boating are two of his hobbies. He pilots small planes and helicopters, and likes to helm his own boats when the mood strikes him. 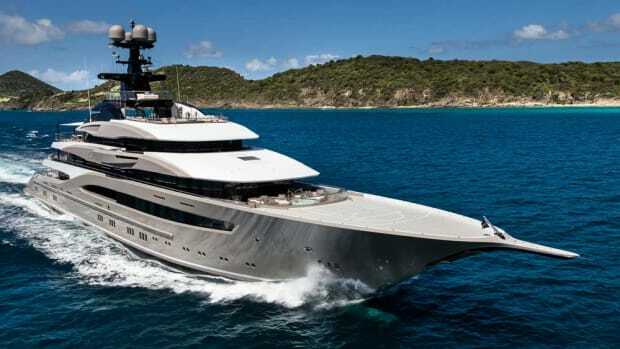 He has owned a number of yachts beginning with a 34-foot (10.3-meter) composite powerboat. He has moved on to increasingly larger boats, and today he maintains a 61-foot (18.5-meter) sailing yacht in addition to Sofia. 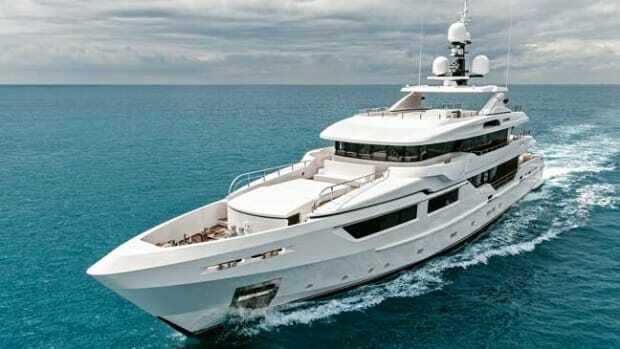 In 2005, he decided he wanted a steel-hulled yacht. An 84-foot (25.6-meter) Moonen captured his imagination. After spending time on Sofia number one, he determined he needed more space and commissioned his second Sofia, a 97-footer (29.5-meter) that was stretched to 100 feet (30.5 meters) by the time she launched in 2008. “We traveled extensively with it and never had any problems whatsoever—great quality build and engineering,” he says. He says he has complete trust in Moonen and the design team, but he enjoys influencing much of the decision making. During the two-and-a-half year build, he and his wife flew to the yard every couple of months. Special engineering was required for Sofia to be able to carry a three-man submarine. He says the boat lets his family enjoy quality time together. 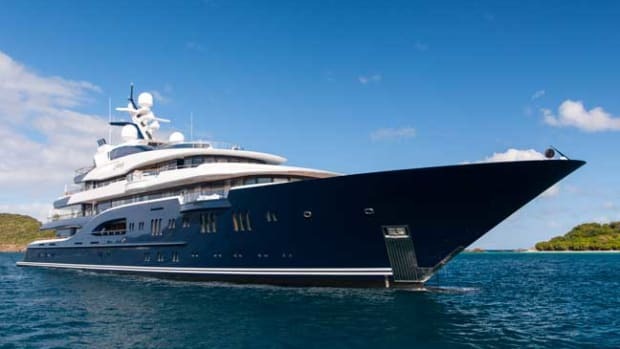 He also winked and said that with a yacht such as Sofia, it isn’t hard to get his teenage daughter to want to spend time aboard, especially because she can bring her friends along. 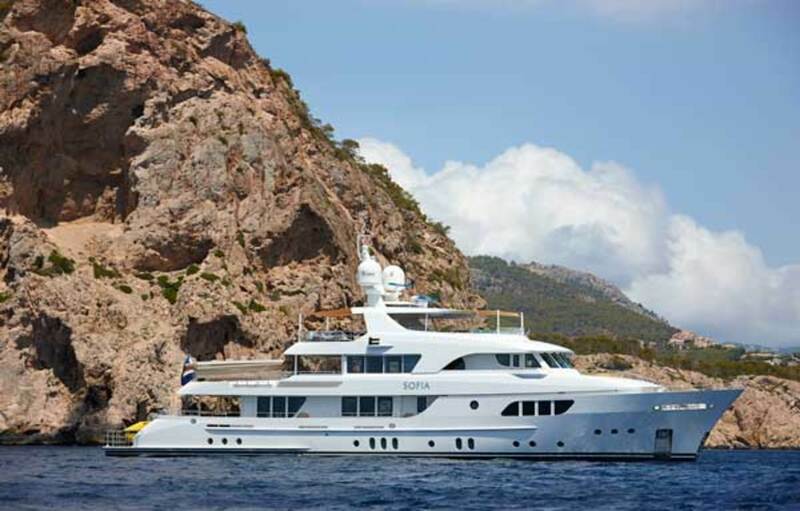 Since the launch of this Sofia, the family has enjoyed a summer of travel in Morocco, Gibraltar and Spain, and a winter in the Bahamas and Caribbean. 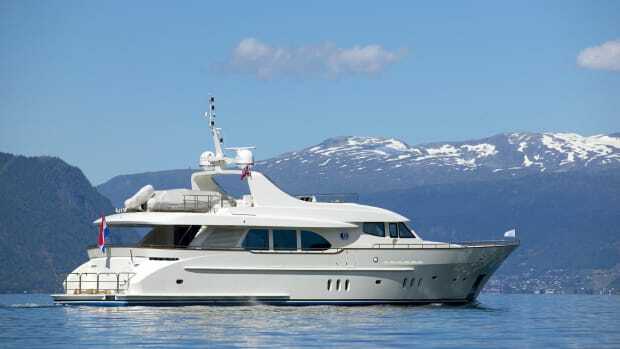 The boat is laid out for maximum comfort for entertaining, relaxing and having fun, and she is extremely quiet under way. 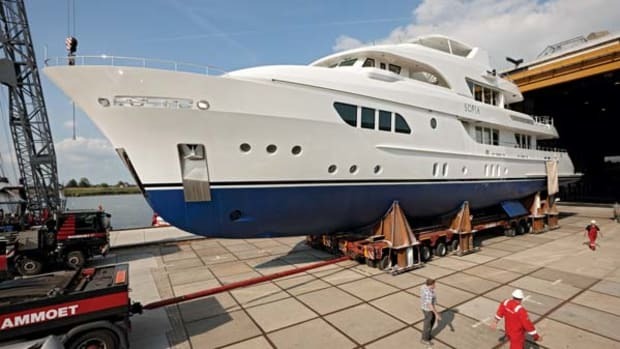 The yacht’s overall length had to be extended and a new swim platform engineered to handle the 4.5-ton C-Quester 3 submarine from U-Boat Worx and the crane to launch it. 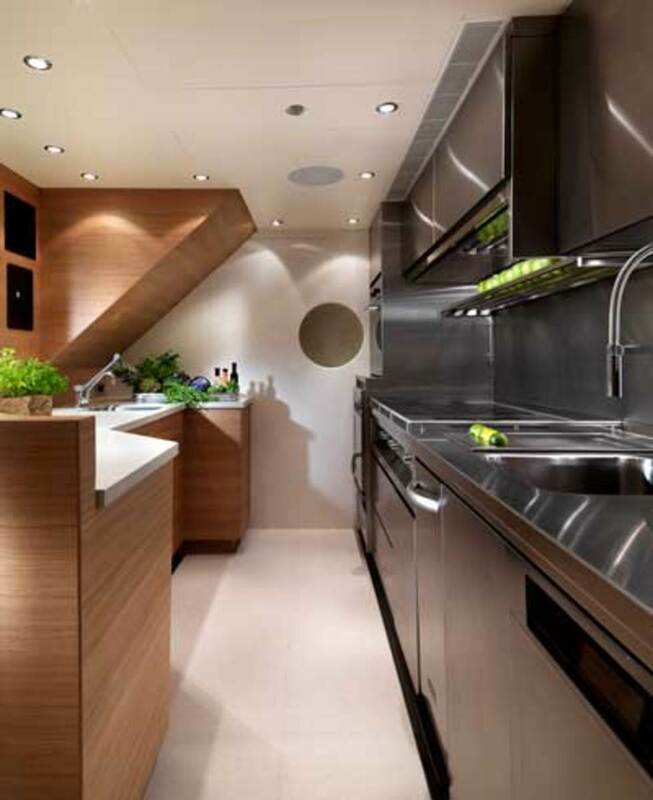 The resulting yacht shape and volume then dictated the interior design. The sturdy expedition-style exterior, with its wheelhouse relatively far forward, belies the contemporary interior. The entire accommodations plan is decidedly different from a traditional explorer vessel. 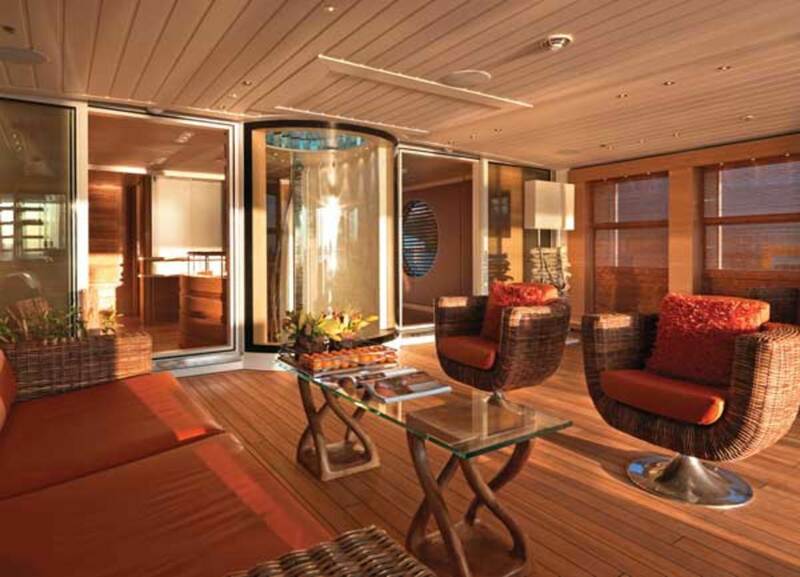 The sky lounge can be air-conditioned or fully open to the elements, depending on the owner&apos;s whim or if the cigar humidor is in use. 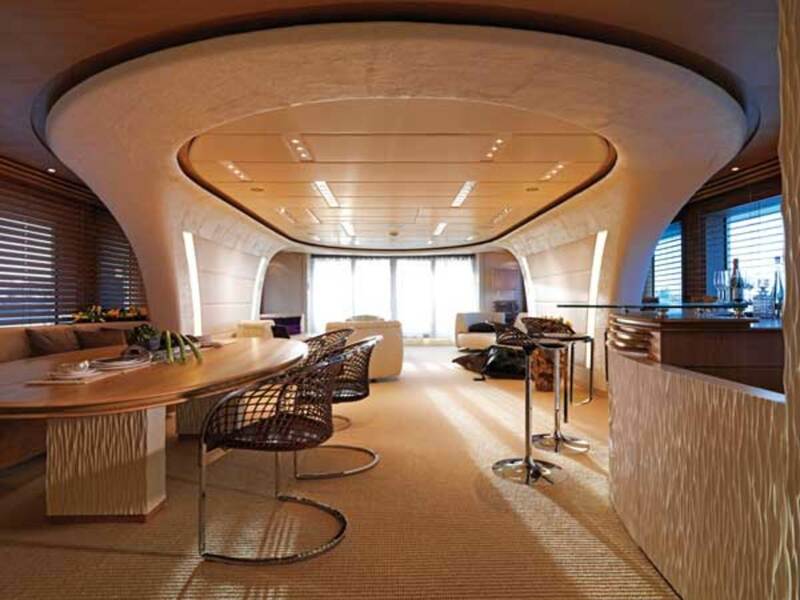 “The challenge was to bring 50-meter spaces to a 42-meter yacht through the use of light shapes and sophisticated materials,” says Pieterse. Art-Line avoided a linear layout with corridors. Instead, there is circular fluidity. The main salon is a large, open plan that flows unrestricted by bulkheads. So many rounded spaces invoke the feeling of a cocoon. The curvaceous shapes of the furniture—a cylindrical coffee table, a beveled bar and an oval dining table—echo the sweeping lines of the entry and overhead. A three-story atrium staircase with a skylight at the top is the focal point of the yacht&apos;s interior. 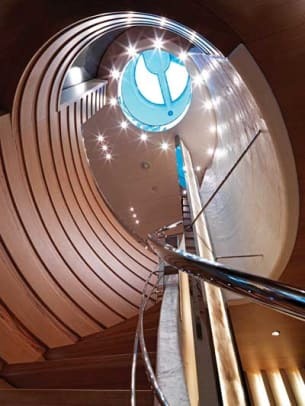 The focal point of the main deck interior is a central oval atrium, which has a stunning spiral staircase with a backlit column made from concetto stone fabricated in Israel. Stainless steel vertical supports ascend three stories. A skylight at the top bathes the atrium in natural light. There is a distinct absence of any doors or walls. A sculptural element hides the ceiling air outlets and the engine and ventilation room shafts. 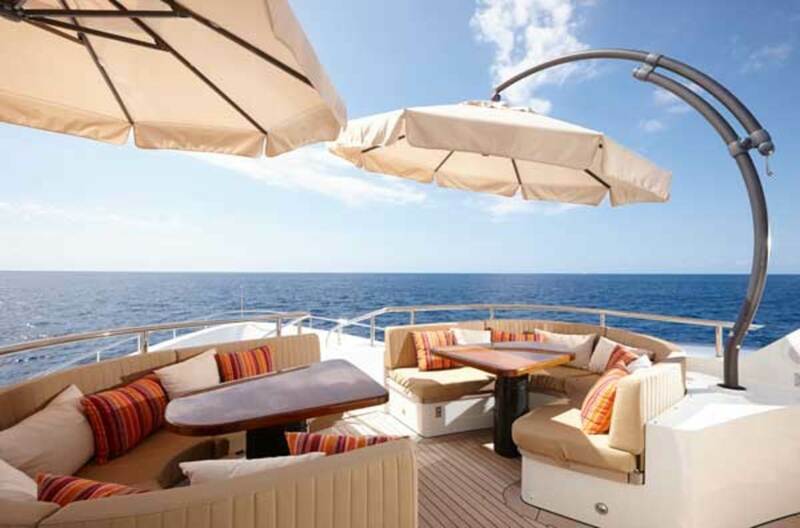 The sundeck has space for a spa pool, cooking and dining. It also supports a tender and three personal watercraft. 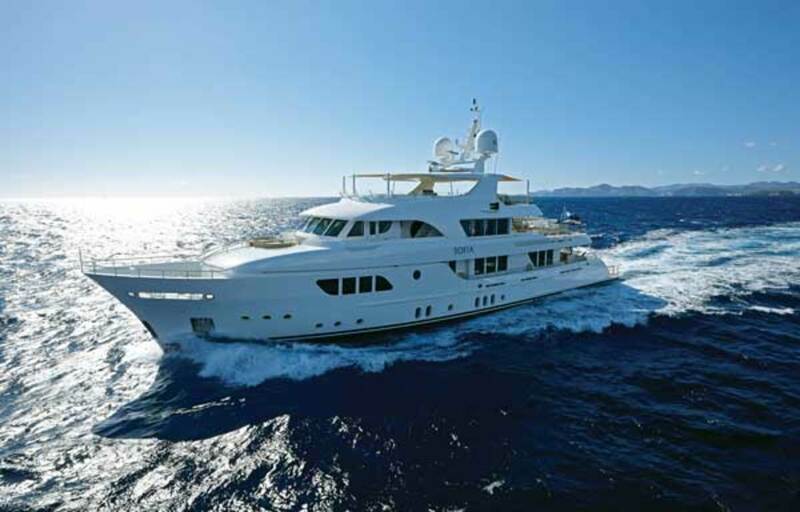 Art-Line, in consultation with the owner, was responsible for the fabrics and thematic colors throughout the yacht. 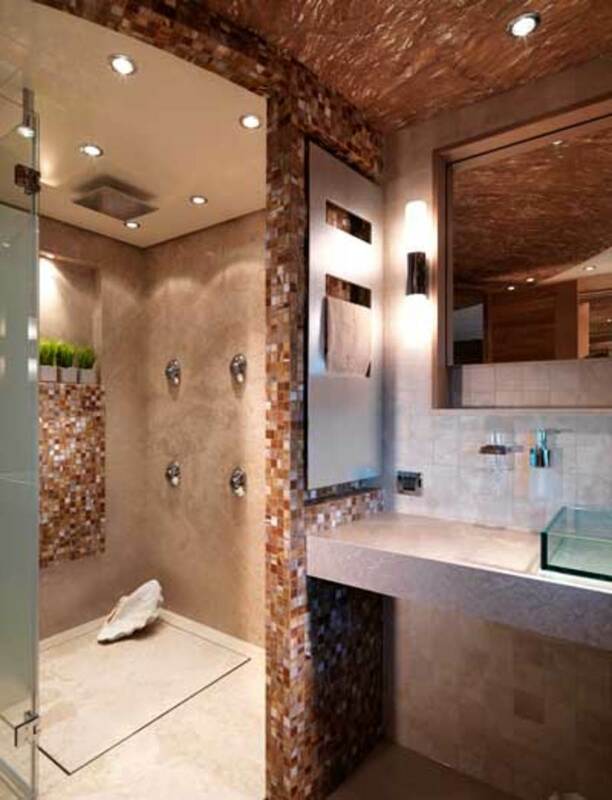 The overall serenity of the interior is balanced with a riot of texture: stone, steel, wood and leather. The palm-leaf wallpaper, Pieterse says, has a non-reflective softness to it that creates a nice contrast with the high-gloss wood finish. Sofia’s interior is exotic and eclectic. The main-deck master stateroom takes advantage of the full beam forward with a private seating area and a generous head. The woods used, oak and zebrano, create a palette of brown and beige tones: cocoa, caramel, cinnamon and clove. A horizontal grain runs along the wood paneling and is mirrored by the horizontal cane wicker in the bed frames and the slats on the window treatments. Small artistic touches were sourced worldwide. For instance, instead of retaining rails on the desk, Art-Line sourced leather trays in Brazil and embedded them into the counters. The guest cabins on the lower deck spiral off the central staircase, again, without the intrusion of corridors. The bridge deck is uniquely laid out so that it is visually connected to the other decks. While sitting in the portside upper salon, one can watch the flow from the central staircase. This upper salon also includes a gym and a lounge. The gym can be completely closed off and, with a pull-down bed, used as an extra guest room. A sitting area on the bridge deck can be fully opened to the fresh air or remain enclosed if guests prefer air conditioning. The owner is fond of cigars with his cognac, so he wanted to appease his wife with the option of fresh air. He can puff away to his heart’s content on the sundeck, which is the communal gathering spot for bar, barbecue, lounging and partaking of the spa pool. Sofia sets a new benchmark for Moonen. There is no greater testament to a builder than a content repeat owner, except maybe one who invests in the company’s future, as this owner did late in 2013.